It’s hot. It’s humid. It’s summer in Maryland. And while Fall is right around the corner, it’s not too late to consider adding a Gazebo to your backyard so you can beat the heat in style. And Mid-Atlantic Deck and Fence can help. We offer a wide variety of screened rooms, from screened porches and screened pagodas to screened gazebos. Beat the Heat: Those mid-summer afternoons can be rough. And all you want to do is barbeque with your friends and family. But no one wants to sit in the hot summer sun all day. The solution: a gazebo! Now you can relax outdoors under the shade of your stylish new gazebo. Boost Home Value: Perhaps best of all, adding a gazebo will help boost your home value. Even if you don’t plan on selling your home in the near future, it never hurts to have a beautiful gazebo to enjoy in the meantime. Avoid Those Pesky Pests: Are you tired of sitting outside on a nice warm spring, summer or fall day, defending yourself from those pesky mosquitoes and other critters? A screened gazebo might be the answer. Just think – no more bugs. You can enjoy those cool summer evenings without being covered by mosquito bites the next morning. Aaaaaah! Curb Appeal: A gazebo can be the focal point your landscape was lacking. These stylish structures are not only functional, they are also incredibly aesthetically pleasing. 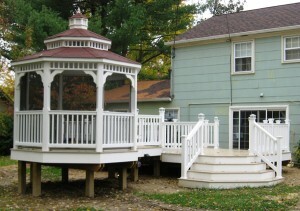 Great throughout the Year: While a gazebo is great in the summer to beat the heat, they are also great all year long. During the fall, a gazebo is an excellent place to retreat and enjoy a nice relaxing autumn rain storm. During spring, there is no better place to sit back and watch nature. And during the winter, you can cuddle up with your husband or wife and enjoy a warm cup of hot chocolate. What could be better? Please take a minute to review some of our previous projects. If you have any questions about adding a Gazebo to your Maryland home, please contact Mid Atlantic Deck & Fence (MAD Fence) today by clicking here or calling 1-800-833-9310. You can also follow us on Facebook and Twitter as well.